Depending on your photosensitivity, you could feel comfortable managing between 5 and 500 of UV per day and there is no way to know beforehand which one is yours. Wear the sensor for 10 days and go about your life. After this, you will have a firm idea of how much UV you receive on a daily basis. 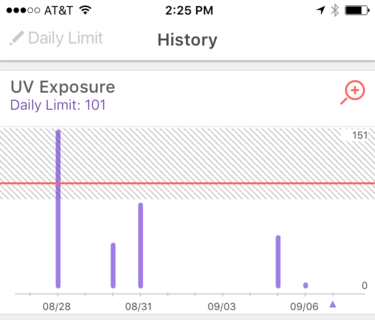 At this point, in the History tab of the app, the top graph shows you a shaded area indicating a good range for a limit of UV exposure, based on your history. Say during these 10 days, the most you received on a particular day was an exposure of 65. You will not be able to set your limit above 65. 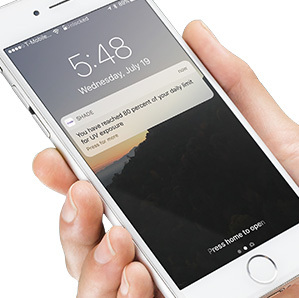 Once you set your UV limit, we use it daily to send you a notification every 20% of that limit. This way you know, at all times, where you stand. In the Check-in tab of the app, we provide you with the ability to report any symptom you may experience on a given day. In the History tab, we display, next to each other, your daily check-in and your daily UV exposure. Use these graphs to pick a limit that makes sense for you. Read our help article on using both graphs to make a decision on your UV limit. If you decide to change your UV limit in the middle of the day, the percentage displayed in the Dashboard will change accordingly. For instance, say you have received 20 UV and your limit is 40 UV, the Dashboard will display 50%. If you change your limit to 80 UV, the dashboard will display 25%. What UV limit do other users have? We've noticed that most users set a limit between 20 UV and 80 UV.